We used these in my daughters room to “frame” the walls. It looks great. They were very easy to apply and reposition if necessary. Highly recommend! These beautiful basic stripes will add a unique feel to any room in your home. Ideal for an accent wall, these stripes can be placed horizontally or vertically to add visual interest. Your order will come with four stripes each one of the same width. Our standard length is the average wall height, which is nine feet If your wall height is eight feet for example, just use a razor knife after applying to cut off the excess. The picture shown in this example, is displaying four charcoal grey stripes. As you can see the wall color shows in between, almost creating an additional set of stripes. Stripes will come grouped together. 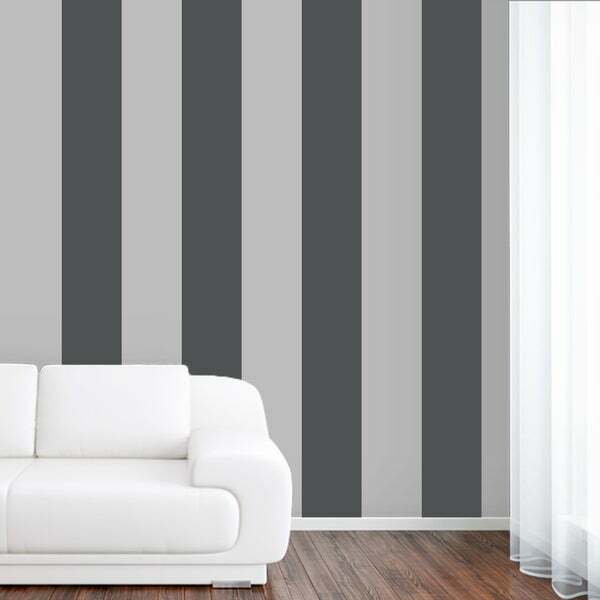 Feel free to cut the stripes apart and apply spaced out as you wish on your wall. "What is the exact dimensions? Thank you." Dimensions: Four (4) stripes 4 inches wide x 108 inches tall. "Are these removable? I live in an apartment and want to visual interest to the wall without making permanent changes. "